The price of undergoing a hair transplant varies depending on the number of hairs involved. If you’re based in Great Britain, you will have access to a number of different clinics providing hair restoration treatment, possibly in your local area. 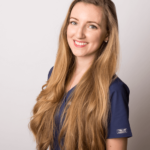 However, this tends to be incredibly expensive, with surgery performed using the FUE2 Safe System costing as much as £8,400 for the largest package. British clinics can be very comfortable, in familiar surroundings (depending on the city your treatment is performed in). Travel costs may be low if you’re able to simply drive to the clinic or take a quick train, without any demand to fly to another country. Transplants range from this low number all the way up to 6000. The number of grafts required during your FUE hair transplant depends on the severity of your hair loss. Your hairline may have receded far from the front of the scalp, or you may experience considerable thinning at the crown — we treat patients with all degrees of hair loss. You may need just 1000 or 2000 hairs transplanting in mild cases, while severe balding tends to call our for 5000 or 6000 hairs. We count the number of hairs to ensure greater precision and accuracy in achieving the density required. One of our specialists will consult with you in the UK, at one of multiple locations for your convenience (Manchester, Leeds, Birmingham, Dublin or London). Which is the Most Important Factor that Defines Hair Transplant Cost? 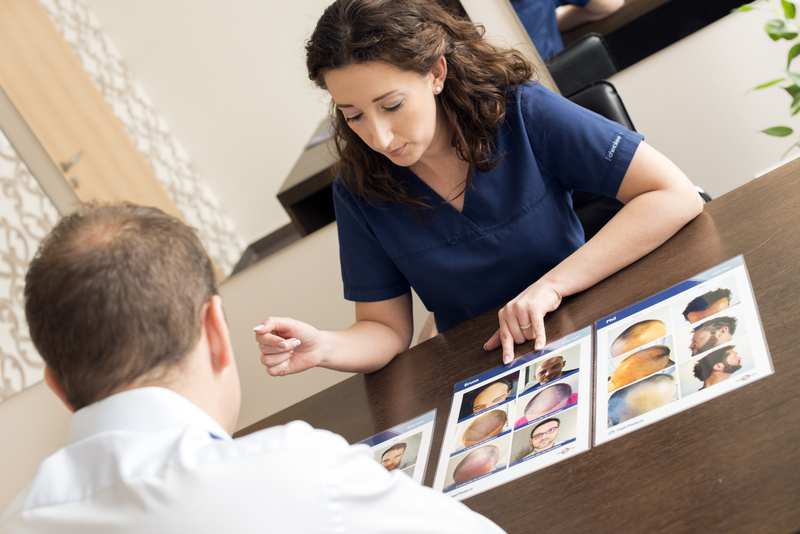 Numerous factors determine the price of your hair transplant surgery. Obviously, a higher number hairs to be transplanted demands a higher rate; 6000 hairs involves more work and time, incurring greater costs overall. However, the main difference is the salaries paid to the surgeons in the UK compared to those in Europe. Opting for a clinic within the United Kingdom will see you charged a larger amount of money to accommodate the higher pay bracket. 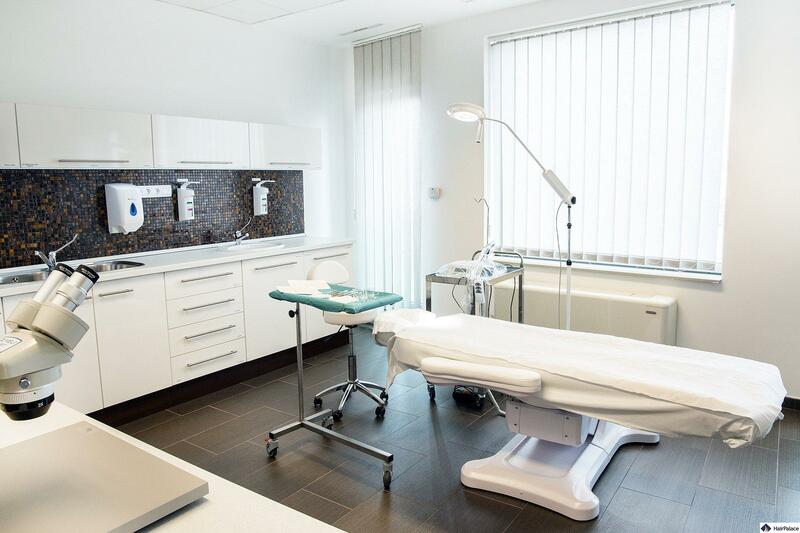 As your HairPalace treatment will be performed in Hungary, our surgeons have lower salaries, allowing for more affordable payment packages for our patients. Let us reiterate: there is absolutely NO drop in quality when undergoing treatment with Hungarian surgeons instead of British ones. The EU’s unified healthcare ensures standards of treatment throughout all member nations: you’ll benefit from the same exceptional quality of care you would expect to receive in a UK clinic without the often extortionate rates. HairPalace’s surgeons combine extensive training and invaluable experience with cutting-edge technology. The FUE 2 SafeScribe is an innovative hair transplant tool offering a high degree of precision and safety, minimizing the risk of hairs becoming damaged during the extraction / implantation process. You can expect nothing less than the best care, support and results with HairPalace; we’re proud of our competitive pricing and our unbeatable service. Your package includes airport transfers, accommodation, consultations and English-speaking experts. In short: you’re in the safest hands at every step of your journey with us. How much will my hair transplant cost at Hairpalace clinic? As you can see, the prices at UK-based clinics escalate quickly, putting hair transplant surgery out of reach for many men who may struggle to afford the full treatment required. At HairPalace, we keep our hair transplant costs highly competitive compared to average rates within the UK — you can save as much as 50% on standard prices by choosing our clinic. We believe in providing exceptional service and amazing results at the most competitive costs. In fact, our hair transplants performed in Hungary can save you as much as 60% against the cost of the same treatment ANYWHERE in the United Kingdom. Because salaries in Hungary are lower, but the techniques and technology employed are 100% identical. You get the same NATURAL results at a LOWER PRICE without compromising on QUALITY. We count the number of hairs required to ensure a natural density in the balding area. This provides greater accuracy than competitors basing treatments on grafts rather than individual hairs, and we provide a variety of packages to suit your exact level of baldness. Every patient’s hair loss is different and every case is unique. How to SAVE thousands of pounds on your hair transplant without compromising in quality? Hungary is a very popular destination for foreign patients who would like to have a high-quality hair transplant for a cheaper price. The EU has unified healthcare standards across all member nations within the past two decades, which ensures you will receive the same professional care and results in a Central-European country as you would in Britain – only at a much lower rate. 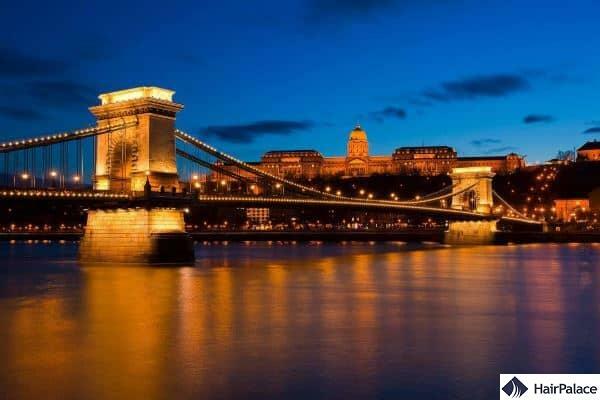 You can reach Budapest by plane cheaply and conveniently, and enjoy secure, safe, English-friendly service. Our colleagues are incredibly professional, experienced, and committed to the very highest levels of service. Over 10,000 people from Western Europe visit Budapest for healthcare treatment, including hair transplants. With HairPalace Hair Transplant Clinic, you can rest assured that you’re in the safest hands. Our surgeons have more than 10 years’ experience performing FUE transplants, and are seasoned experts with hundreds of treatments behind them. On top of all this, you will also get to see the beauty of Budapest during your stay! If you want to receive cheaper but high-quality medical services, the best choice would be the Hungarian capital, Budapest. Hungarian doctors offer world-famous healthcare services. Moreover, health tourism is one of the most popular services in Budapest. As you can see, we provide a varied portfolio of FUE2 Safe System solutions to suit your unique situation, and there are significant savings to be made by paying in cash. We are passionate about delivering the most transparent, compassionate service in the industry. Nobody cares more about your satisfaction than HairPalace Hair Transplant Clinic. What is included in your hair transplant package at this price? HairPalace Hair Transplant Clinic is committed to the most transparent, professional, and efficient hair restoration surgery. We use only the most state-of-the-art FUE2 Safe System hair transplant technology to ensure natural results which stand the test of time (according to the hair’s genetic program in the target area). 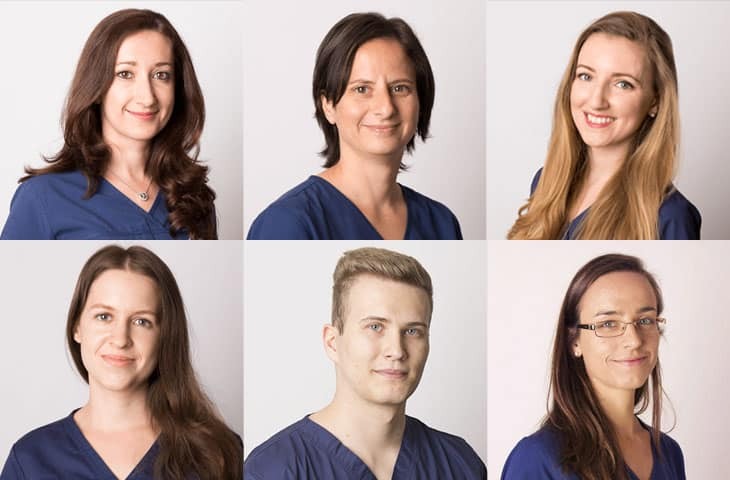 While you can meet our colleagues in the UK ahead of your surgery, all of our treatments are performed in Budapest, Hungary. While Turkey is a popular destination for hair-transplant surgery, we offer an exceptional, cost-effective package for patients craving a more youthful, natural hairline. What else does your money buy beyond the FUE2 Safe System treatment? A comfortable drive from the airport to your apartment and back. Our English-speaking colleagues prevent any language-related issues to enhance the comfort, convenience, and satisfaction of your time at our hair transplant clinic. Your surgeon will meet with you to discuss your unique treatment plan, assess your personal needs, and invite you to sign the necessary documents when you feel completely satisfied. You will pay on the day of your treatment, before your hair transplant begins. No hidden costs are included. Payment is accepted by cash (with a discount) or credit card. We will implant the number of hairs agreed, employ the FUE2 Safe System for the best results, and give you the clothes you need for the surgery. You will also receive a two-course lunch and a package of medication. We will provide you with a written guarantee following your surgery. We will also RE-IMPLANT missing hairs for FREE if below 80% of your implanted hairs grow back. You will receive a document outlining the post-operative tasks required on your surgery day. We will provide you with a medication package and saline solution to last you one week after your transplant. We will monitor your healing process across the first year following your treatment, and offer 24/7 customer service. Your FUE hair transplant is comprehensive, but there are certain things we DO NOT offer as part of your package. Tests – Contains all required. Accommodation – Test package includes 1 night in our premium apartment, with transfers to the laboratory and back. The results will be sent to us by email within 12 hours of your test. Payment – Your blood test package MUST be paid for in cash at our HairPalace Hair Transplant Clinic when you arrive (between 08.30 and 17.00). You will be given your referral once the payment is complete. Arrival – Your fasting blood test can be arranged for between 07.30 and 09.30 on weekday mornings. You should arrive two days before the treatment begins. Our FUE2 Safe System hair transplant systems DO NOT include the cost of your plane ticket – you MUST buy your own plane ticket. Send a confirmation of your plane ticket to our colleagues within 48 hours of the booking. 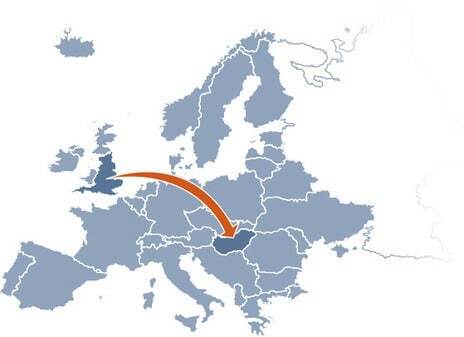 Booking a flight from London to Budapest in advance can cost below £100, depending on how early you make your purchase. Which hair transplant method do we use and recommend? The improved version of the original FUE process was invented by James Harris MD, owner of the HSC Colorado clinic in the USA. During the transplantation, a special tool, SafeScribe is used to harvest the grafts, which is basically a miniature rounded drill. Thanks to the rounded SafeScribe drill – compared to the original FUE needle – there is no deep incision made, so harming the grafts is practically excluded. This way 95-100% of the implanted hairs grow back after the hair transplantation!!! 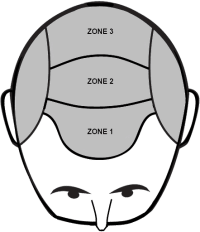 SafeScribe punch also has a depth-blocking device that can prevent the doctor to cut deeper in the skin, thus less deep wounds are caused on the scalp. Thanks to this device, healing process is 50% shorter compared to the normal FUE method. The donor area heals without visible scars following the intervention. HairPalace’s hair transplant surgery is performed in Budapest, Hungary. This is a beautiful city with lots to offer, and you may have time to explore it during your trip; you’ll be able to enjoy fine dining and many stunning sights. We’ve already discussed that travelling to Hungary is a much more cost-effective way to transform your hairline than paying the higher rates demanded by UK-based clinics — you’ll save as much as 50% on your treatment (depending on the package you choose). During your stay in Budapest, you will be given a premium apartment in which to relax and you only pay on the day of treatment. There are no hidden charges to worry about and we can take payment by credit card or cash(we offer a discount for the latter method too). 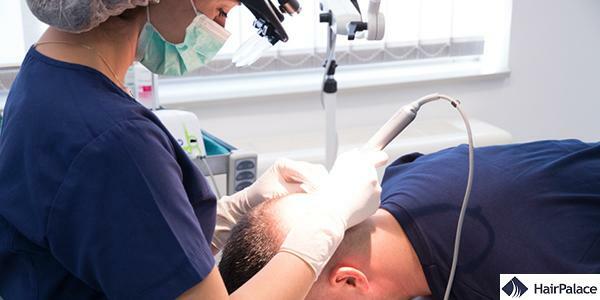 This brings our in-depth post to a close, but if you still have any questions about undergoing a hair transplant with HairPalace, please don’t hesitate to get in touch! We’ll give you a free quote and are happy to discuss your needs.